Students and staff take their fight to East Hartford Town Council. Students, faculty and staff of Synergy Alternative High School are hoping to keep their school open, despite a decision by the East Hartford Board of Education to close the school. On Wednesday night, they held a rally outside East Hartford Town Hall, then took their fight inside to Town Council. 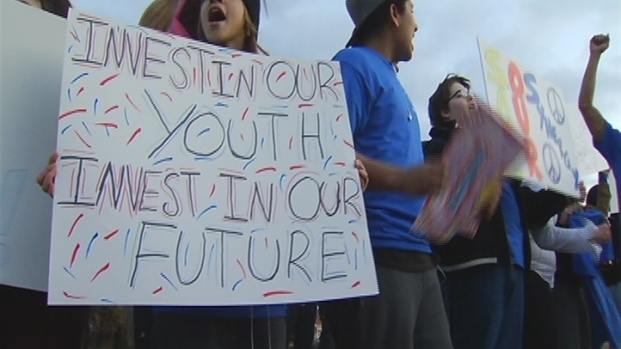 At the rally, students described the school as a place that turned their lives around. "It's a really good school and it saves a lot of lives," Brendan Keith said. "If it wasn't for Synergy, I would be a drop-out right now." At a public hearing, Synergy High students speak out against the proposed budget-saving measure to close their school. Other students voiced their solidarity. "We're not going to go down with out a fight," said senior Angel Fontanez. "We're not going to accept that." Synergy High School is an alternative program that has been around for more than three decades in the East Hartford School District. The school works with students who have difficulty succeeding in a traditional high school setting. During Wednesday night's meeting, one student told council members about his difficult high school history, which culminated in an arrest for bringing drugs and a knife to school. He said the school helped him find the confidence to turn his life around. "Right from the start, Synergy welcomed me with open arms. They saw something in me that, at the time, I didn't see in myself. They saw a leader, not an ex-con, not a bad kid." Council members made no decision as they continue to consider the Board of Education's budget. Synergy supporters said they have plenty of fight left in them and plan to take their story to state legislators next.